It's been 10 years since Iceland's economy crashed, but Asthildur Thorsdottir and her husband Hafthor Olafsson are still struggling with crippling debt and an uphill legal battle to save their family home. After taking out what would end up being a toxic loan, the parents of two now adult sons have lived under the threat of eviction since 2012. The couple has spent countless hours and huge sums fighting to keep their house. "I don't know whether I would have started all this if I'd known it would take so much from our lives," says Asthildur, a 51-year-old grammar teacher. She and her husband bought their home 11 years ago, shortly before Iceland's inflated banking system crashed. They wanted more space than what their two-bedroom apartment on the outskirts of Reykjavik offered them and their children, who were then in primary school. With prices rising, the couple bit the bullet in mid-2007 and bought a 165-square-metre (1,775-foot) house in a residential area of Reykjavik for 55.4 million kronur (443,000 euros, $512,000 at today's exchange rates). They paid part up front, and for the remaining 30.4 million kronur they took out a 40-year mortgage indexed against the stable Swiss franc and Japanese yen. "This kind of loan was recommended by everybody. The banks, the realtors, etc," explains Hafthor, a 54-year-old audio and video equipment salesman. "We did look at the currency rate some 15 years back and we estimated that we could easily manage up to a 30-percent fluctuation," says Asthildur. 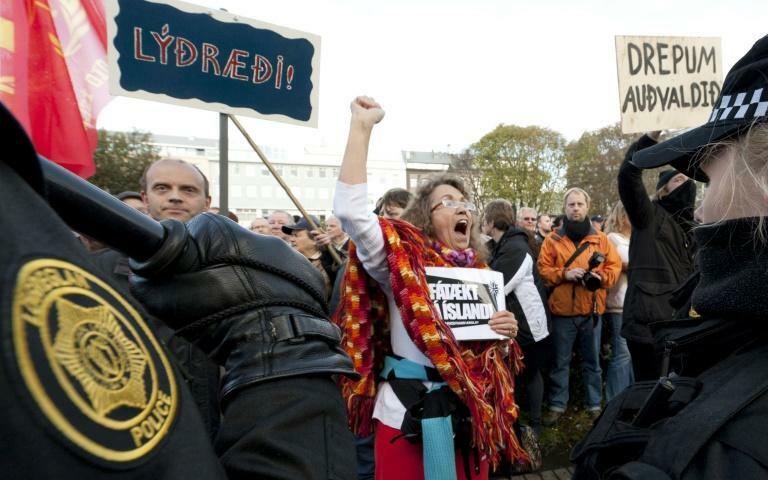 But in October 2008, Iceland's banks were declared insolvent, sending the entire economy crashing down. According to a 2011 report from the Icelandic Financial Services Association, around 70,000 Icelanders -- out of a population of 320,000 -- had signed these kinds of loans, with attractive interest rates, to splurge on a new 4x4, a bigger house or even a holiday. But between August and November 2008, the value of the krona tumbled by more than 50 percent, sending inflation soaring to 18 percent. Households, whose mortgages were either indexed against inflation or foreign currencies, saw their monthly payments skyrocket. "Our mortgage more than doubled and the amount we borrowed went up to 74 million kronur," Hafthor recalls -- more than the cost of the home. In June 2010, the Supreme Court ruled that loans indexed against foreign currencies were illegal and that households were not required to pay back the share of their mortgage that corresponded to forex losses. But this was just the beginning of some home buyers' woes, with banks launching lawsuits against families for defaulting on payments. For the large majority of indebted homeowners, the authorities found a solution. "Most of the loans were revised downwards, enabling this enormous weight to be lifted from Icelandic households," said Katrin Juliusdottir, the head of the Icelandic Financial Services Association. In order to make this work, banks had to cough up around 200 billion kronur, or about 10 to 15 percent of gross domestic product (GDP) at the time, and the state around 100 billion kronur. Household debt, which exceeded 120 percent of GDP in 2009, fell to less than 80 percent in 2017, a government report showed earlier this year. But more than 6,000 homeowners in Iceland lost their homes in foreclosure sales in 2008-2015, according to statistics published by parliament. That doesn't include those who had to sell their homes in order to pay their debts, and for whom there are no official statistics. For Asthildur and Hafthor, the eviction threat hanging over their heads since 2012 for unpaid mortgage payments remains. As part of their fight, they are withholding payment until their monthly payments are recalculated. "We will pay what we owe when it's legally calculated," says Hafthor. But for 10 years, the family has been living in uncertainty. "This is one-fifth of my life that has gone into this ... This is time that we have not been able to make any progress in our lives, to plan for the future, to go on vacations, to make financial plans," said Asthildur, her eyes welling up with tears. "The biggest sacrifice is the things we could have done with our sons which we haven't done." Before the crisis, the family used to go on holiday abroad every two years. The couple acknowledges things could have been even worse. "There are so many other stories that are so horrifying to read," says Hafthor, referring to divorces and even suicides triggered by the crash. "We still have our family, we're still husband and wife, we have relatively good health, we have our kids and more or less, we are okay." But they feel very bitter. "Obviously, we are fighting the bank. But basically, we are fighting the government," Hafthor says. "Because the government at the time passed this law that (allowed) the bank to behave in this illegal manner."